David Archuleta agrees that Pinoys make visits of guests to the Philippines \"comfortable\"
David Archuleta agrees that Pinoys make visits of guests to the Philippines "comfortable"
"I feel very comfortable with just the people. I feel that fans are very warm here. That's why I feel that it would be a comfortable experience here," says former American Idol season seven runner-up David Archuleta about his previous visits in the Philippines. He's currently in Manila to do TV5's upcoming television series Nandito Ako. 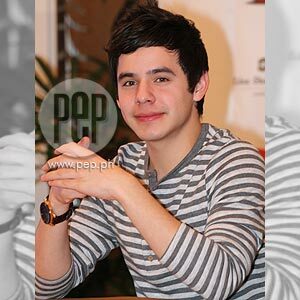 Prior to accepting TV5's offer to headline the network's newest soap opera, American Idol alumnus and season seven runner-up David Archuleta had visited the Philippines three times. These visits were very brief, less than 24 hours each, only enough to do concerts, or to promote his albums. But those short stays were more than enough for the young singer to experience what the country offers. He readily admits that, from these visits, it's really more fun in the Philippines. In an interview by PEP.ph (Philippine Entertainment Portal) last week, David did not hesitate to relate the reasons why he thinks the Philippines is more fun. For one, he says, the fans are warmer here than anywhere else. that it would be a comfortable experience here." He adds, "For me, the number one thing about any place is people. That's what interests me, and what I remember the most anywhere I go. friendly, and they're very supportive as well. Philippines, so it's always fun to me when I come to the Philippines." Asked to name Filipino things that excite him whenever he's in the country, David was quick to mention the food, the tourist spots, and the unforgettable experiences. The food that David pleasantly remembers and has tasted in his past visits are tokwa't baboy, sisig, and papaitan. "They're all good," he says with delight. During his short stint, this time, in the country, David hopes to visit the best tourist spots, but he's concerned that he just won't have the time. each day may be spent shooting the TV5 soap, Nandito Ako. David, recalling his last jeepney ride in the Philippines: "I remember that it was a fun experience, so I might be able to do that again," he says.